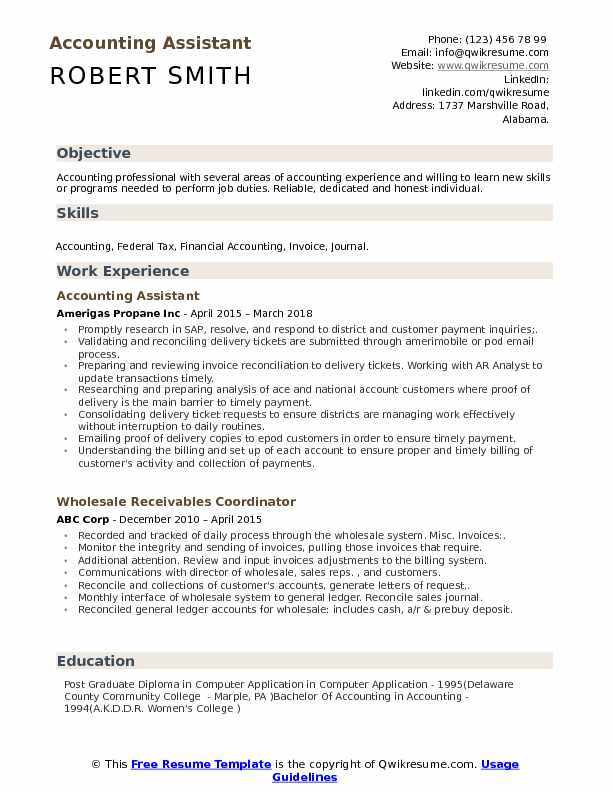 An accounting assistant helps an account manager handle all accounting procedures in the company. The job role includes basic clerical works like typing and handling client inquiries as well as assisting in things like controlling, verifying and generating the invoice for suppliers. The duties also include preparing account payable checks and other more specific account works. The tasks performed by the individual are vital to the company hence he must be detail oriented. 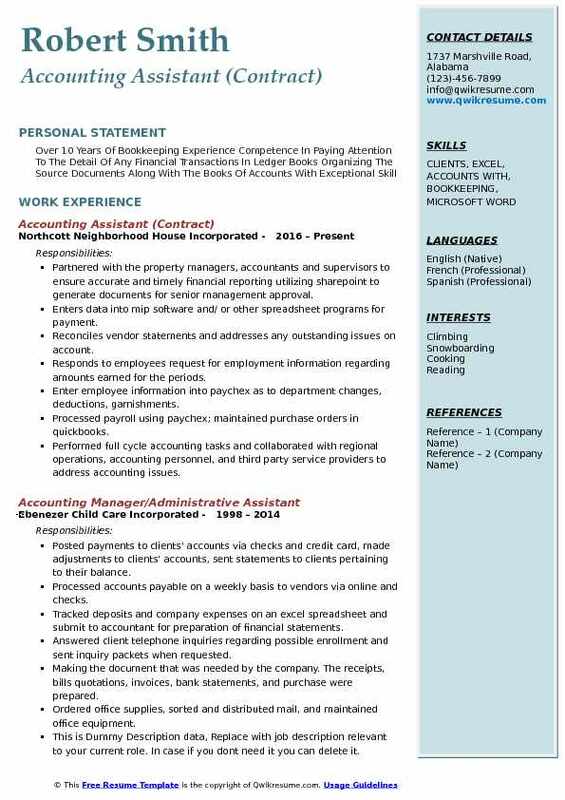 Accounting assistant Resume depicts responsibilities like ensuring records are current and complete and calculations are accurate for all daily transactions and bank transactions, preparing tax invoice and maintaining the inventory. The key skills of an account assistant are being detail oriented with good knowledge of accounting software like Tally and others and accuracy of work. The individual should have good command over calculations and be able to work under stress meeting month end deadlines well. The individual should be well versed with taxation and its rules. A much sought after qualification for this role is bachelors in accounting or equivalent. 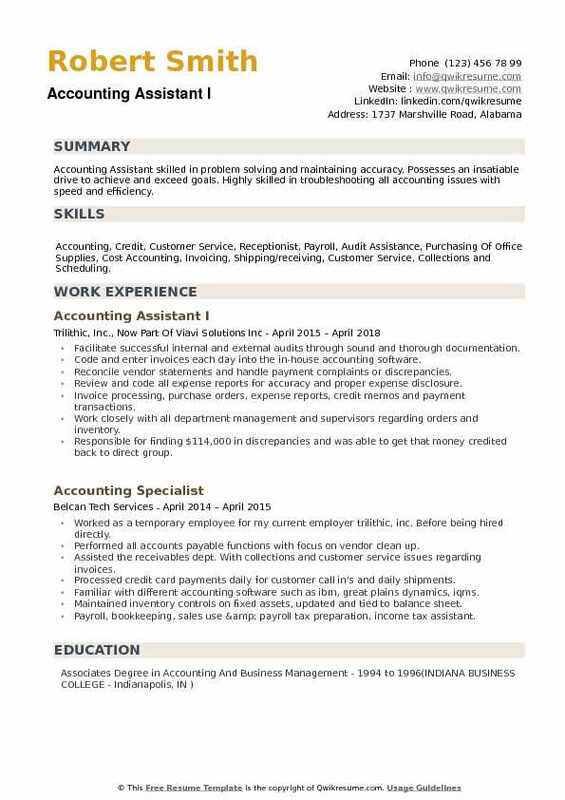 Headline : Accounting professional with several areas of accounting experience and willing to learn new skills or programs needed to perform job duties. Reliable, dedicated and honest individual. 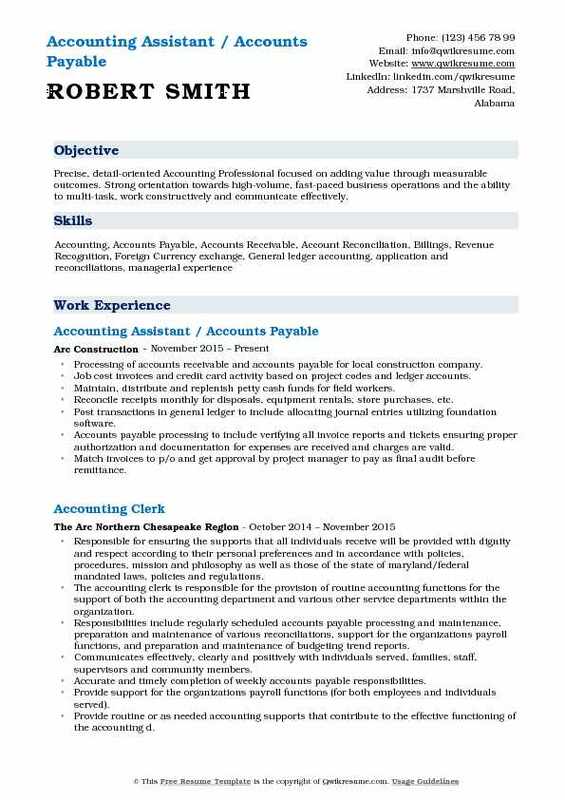 Skills : Accounting, Federal Tax, Financial Accounting, Invoice, Journal. Promptly research in SAP, resolve, and respond to district and customer payment inquiries;. Validating and reconciling delivery tickets are submitted through amerimobile or pod email process. Preparing and reviewing invoice reconciliation to delivery tickets. Working with AR Analyst to update transactions timely. Researching and preparing analysis of ace and national account customers where proof of delivery is the main barrier to timely payment. Consolidating delivery ticket requests to ensure districts are managing work effectively without interruption to daily routines. Emailing proof of delivery copies to epod customers in order to ensure timely payment. Understanding the billing and set up of each account to ensure proper and timely billing of customer's activity and collection of payments. Managing A/R for assigned accounts through account analysis, customer calls and account research. Reconciling accounts, researching unapplied cash, short pays and collecting outstanding balances. Identifying reconciliation items and ensures proper and timely resolution. Building effective working relationships with customer's contacts - both internal and external. Objective : To secure a position in which professional competencies are utilized in a dynamic and challenging environment that values teamwork, individual effort and encourages personal development. 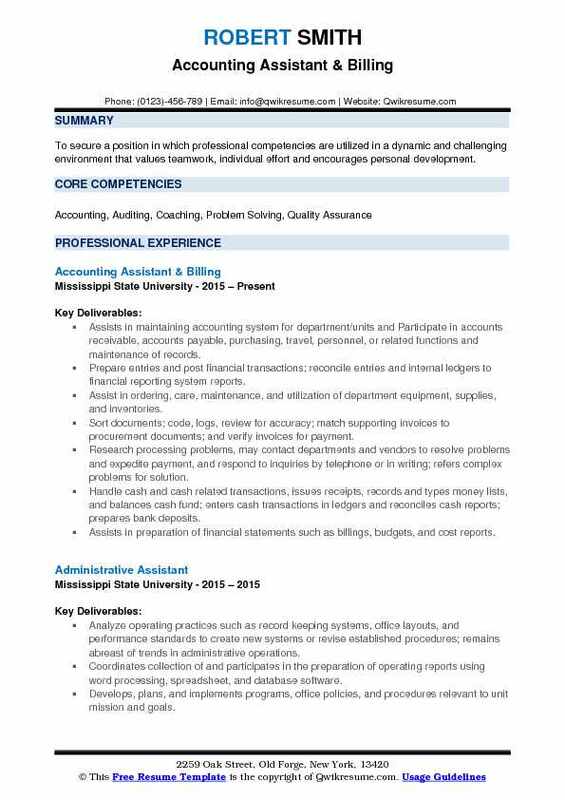 Assists in maintaining accounting system for department/units and Participate in accounts receivable, accounts payable, purchasing, travel, personnel, or related functions and maintenance of records. Prepare entries and post financial transactions; reconcile entries and internal ledgers to financial reporting system reports. Assist in ordering, care, maintenance, and utilization of department equipment, supplies, and inventories. Sort documents; code, logs, review for accuracy; match supporting invoices to procurement documents; and verify invoices for payment. Research processing problems, may contact departments and vendors to resolve problems and expedite payment, and respond to inquiries by telephone or in writing; refers complex problems for solution. Handle cash and cash related transactions, issues receipts, records and types money lists, and balances cash fund; enters cash transactions in ledgers and reconciles cash reports; prepares bank deposits. Assists in preparation of financial statements such as billings, budgets, and cost reports. Distribute, review, calculate, and process payroll time sheets and employment documents; verifies account numbers; maintains leave and other payroll records. Objective : A strongly motivated individual with excellent office organizational management skills, seeking to obtain a position to utilize extensive background in maintaining official records, handling budgets and performing administrative assistance tasks. Direct experience assisting with contract and grant financial operations for post award/financial service. Analyze, review, and approve chatfield/budget expenses while ensuring compliance with all sponsor and institutional requirements and policies (requisitions, erfps, travel). Knowledge of multiple funding agency guidelines, including federal and state (nih). Knowledge of peoplesoft (rebudgeting, requisitions, erfps, updating information). Respond to inquiries and assist in obtaining additional paperwork for charges. Consult with institutional management and legal department about contract/grant concerns. Liaise with number of departments and facilitate customer service initiatives of the internal osp. Work with senior management to create policies and procedures manual for the ctsi-osp office. Summary : Accounting professional with proven experience in accounts payable and accounts receivables with communications and technical office administration experience. Research payments and credits that do not match the customers account and/or invoice. Report non-ar cash received as well payments that need to be transferred to another division. Maintain vendor files in the accounting system as wells as paper files. Close ap and po modules at the end of the month, running various reports. Assist the receivables department with applying customer payments to appropriate accounts. Finding payment differences versus actual amount invoiced in accounts payable. Figuring shipping cost per piece of specific parts received from the supplier. Accounts payable, accounts reconciliation, accruals, and journal entries, assisted with month end close. Prepared and ran bi-weekly checks and bi-weekly wires for all accounts payable vendors. Prepared analysis reports for freight vendors, tracking vendor credit memos and vendor charge backs. Partnered with the property managers, accountants and supervisors to ensure accurate and timely financial reporting utilizing sharepoint to generate documents for senior management approval. Enters data into mip software and/ or other spreadsheet programs for payment. Reconciles vendor statements and addresses any outstanding issues on account. Responds to employees request for employment information regarding amounts earned for the periods. Enter employee information into paychex as to department changes, deductions, garnishments. Processed payroll using paychex; maintained purchase orders in quickbooks. Performed full cycle accounting tasks and collaborated with regional operations, accounting personnel, and third party service providers to address accounting issues. Objective : Precise, detail-oriented Accounting Professional focused on adding value through measurable outcomes. Strong orientation towards high-volume, fast-paced business operations and the ability to multi-task, work constructively and communicate effectively. Processing of accounts receivable and accounts payable for local construction company. Job cost invoices and credit card activity based on project codes and ledger accounts. Maintain, distribute and replenish petty cash funds for field workers. Reconcile receipts monthly for disposals, equipment rentals, store purchases, etc. Post transactions in general ledger to include allocating journal entries utilizing foundation software. Accounts payable processing to include verifying all invoice reports and tickets ensuring proper authorization and documentation for expenses are received and charges are valid. Match invoices to p/o and get approval by project manager to pay as final audit before remittance. 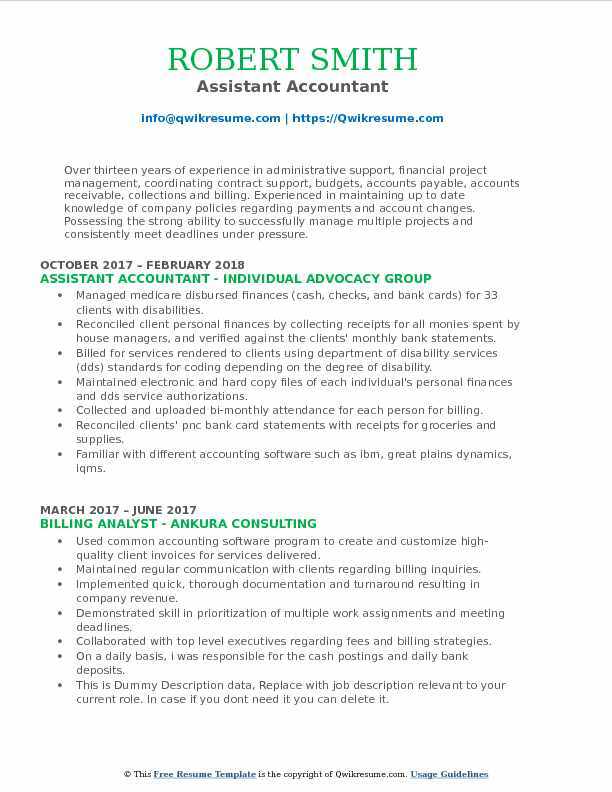 Summary : Over thirteen years of experience in administrative support, financial project management, coordinating contract support, budgets, accounts payable, accounts receivable, collections and billing. Experienced in maintaining up to date knowledge of company policies regarding payments and account changes. Possessing the strong ability to successfully manage multiple projects and consistently meet deadlines under pressure. Managed medicare disbursed finances (cash, checks, and bank cards) for 33 clients with disabilities. Reconciled client personal finances by collecting receipts for all monies spent by house managers, and verified against the clients' monthly bank statements. Billed for services rendered to clients using department of disability services (dds) standards for coding depending on the degree of disability. Maintained electronic and hard copy files of each individual's personal finances and dds service authorizations. Collected and uploaded bi-monthly attendance for each person for billing. Reconciled clients' pnc bank card statements with receipts for groceries and supplies. Familiar with different accounting software such as ibm, great plains dynamics, iqms. Conducted an end of fiscal year audit for 2016/17 to collect and document any missing receipts for each client's personal finances. Summary : Accounting and Financial Management Professional with over 18 years' experience which includes Military, Governmental and Private Commercial settings. Managed accounts and finances as high as 1 Billion dollars and as low as employee payroll processing. 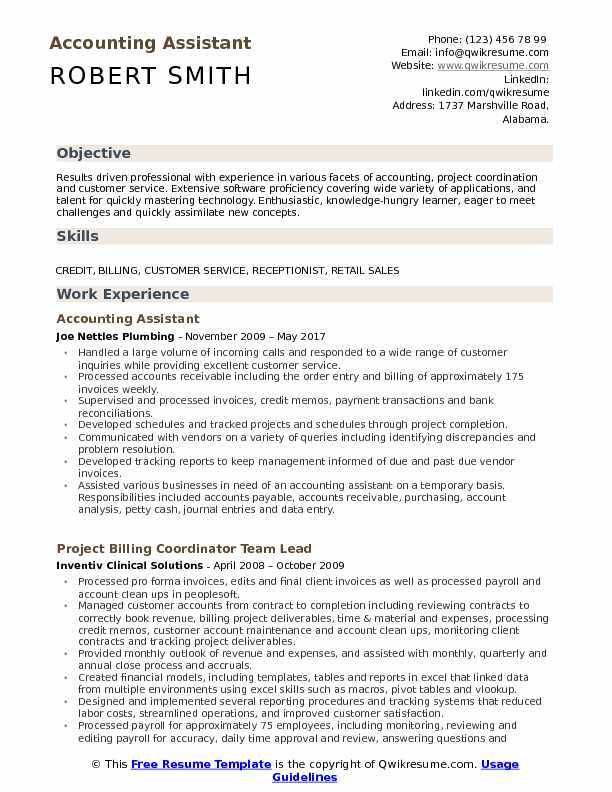 Experienced cost controller that also managed project budgets, including analyzing, monitoring and creation of reports. Manage the processing of over 250 daily requests from the accounts payable department and reconciles over 75 vendor statements daily. Verifies that supporting documentation and balances are accurate using appropriate tools and procedures. Accurately enters data into appropriate accounting systems as required. Prepares clear, concise and accurate financial reports and forms for use by departments and outside agencies. Managed the prompt and courteous response to questions concerning financial matters. Resolves accounting, general ledger, fixed asset, accounts payable, accounts receivable, treasury or payroll questions with other department heads and employees appropriately and in a timely manner. Identifies discrepancies between accounting system ledger, premium bills, lock boxes, and/or other financial statements. 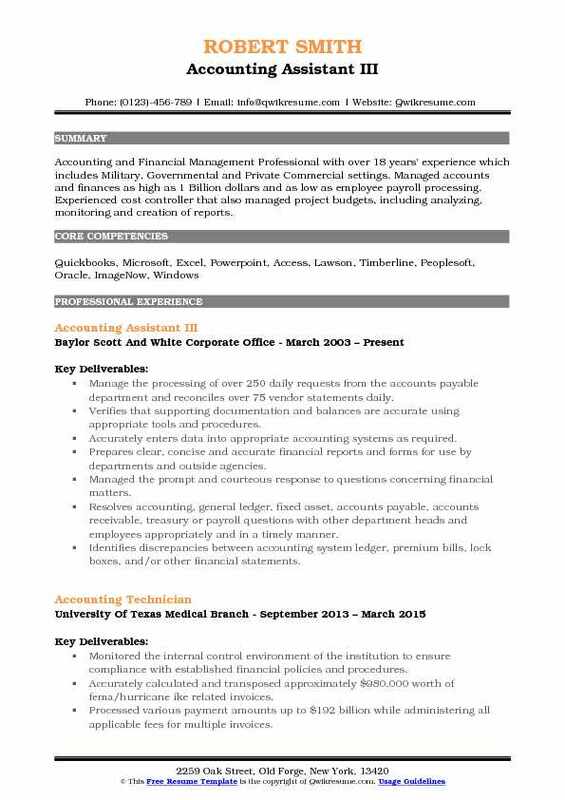 Summary : Capable employee with remarkable working experience in accounting and bookkeeping. Successful at managing multiple projects and consistently meeting deadlines under pressure. Responsible for performing a wide range of general clerical and accounting support functions. Prepared month-end journal entries to post to the general ledger accounts. Reconciled bank statements and balance sheet accounts through blackline account reconciliation software. Used quickbooks pro to generate invoices upon receipt of billing information. Assisted in payroll by figuring out the employees hours from their tech logs, entering that information on their spread sheets and then entered it in quickbooks. Kept track of the expenses and what employees were spending on their amex credit card and entered all receipts into the proper expense accounts into quickbooks. Did billing for the ups account and entered all shipments into their proper accounts in quickbooks. Handled the company's second business, their payroll, banking, and all receipts into quickbooks online. 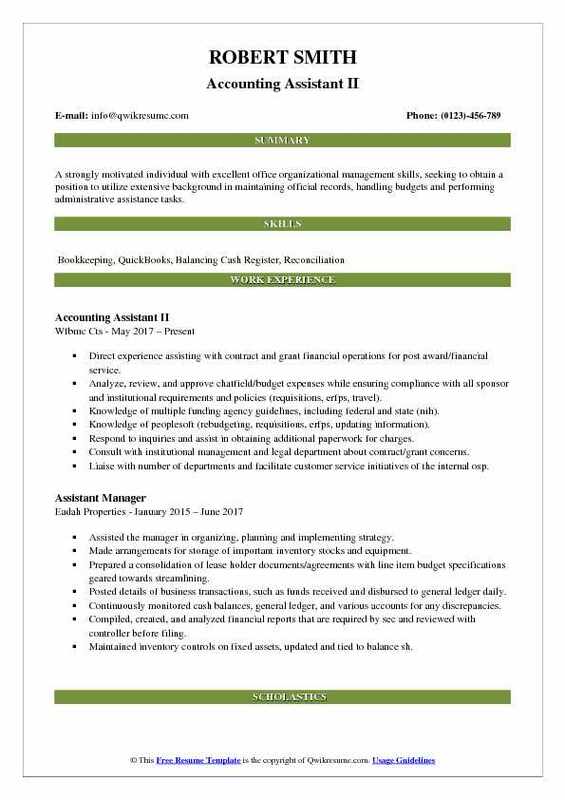 Objective : Accounting Assistant skilled in problem solving and maintaining accuracy. Possesses an insatiable drive to achieve and exceed goals. Highly skilled in troubleshooting all accounting issues with speed and efficiency. 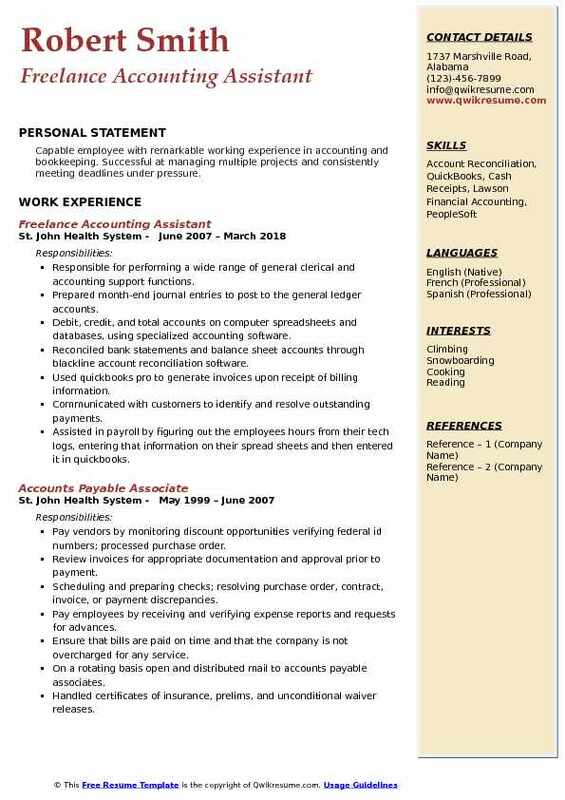 Skills : Accounting, Credit, Customer Service, Receptionist, Payroll, Audit Assistance, Purchasing Of Office Supplies, Cost Accounting, Invoicing, Shipping/receiving, Customer Service, Collections and Scheduling. Review and code all expense reports for accuracy and proper expense disclosure. Invoice processing, purchase orders, expense reports, credit memos and payment transactions. Work closely with all department management and supervisors regarding orders and inventory. Responsible for finding $114,000 in discrepancies and was able to get that money credited back to direct group. Summary : Results driven professional with experience in various facets of accounting, project coordination and customer service. Extensive software proficiency covering wide variety of applications, and talent for quickly mastering technology. Enthusiastic, knowledge-hungry learner, eager to meet challenges and quickly assimilate new concepts. Handled a large volume of incoming calls and responded to a wide range of customer inquiries while providing excellent customer service. Processed accounts receivable including the order entry and billing of approximately 175 invoices weekly. Supervised and processed invoices, credit memos, payment transactions and bank reconciliations. Developed schedules and tracked projects and schedules through project completion. Communicated with vendors on a variety of queries including identifying discrepancies and problem resolution. Developed tracking reports to keep management informed of due and past due vendor invoices. Assisted various businesses in need of an accounting assistant on a temporary basis. 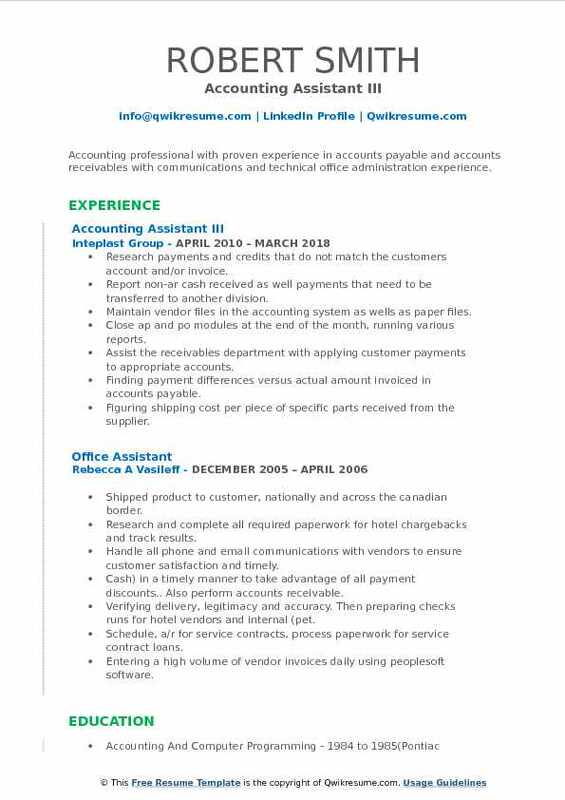 Responsibilities included accounts payable, accounts receivable, purchasing, account analysis, petty cash, journal entries and data entry.